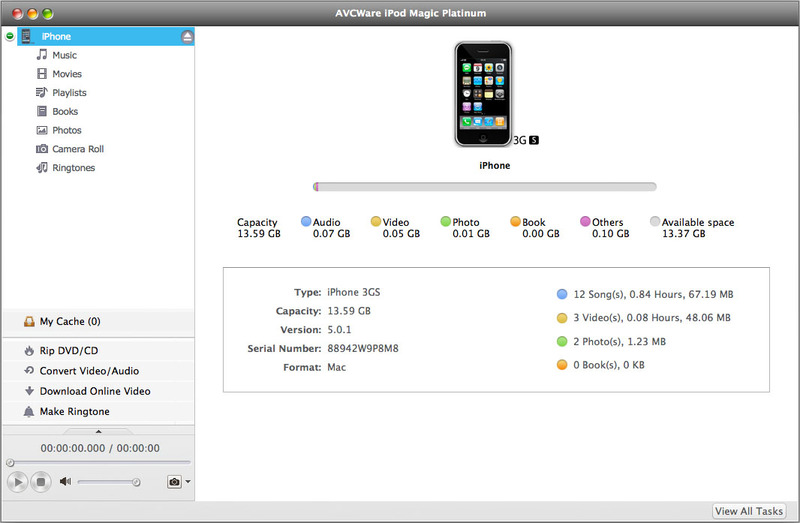 AVCWare iPhone Magic Platinum for Mac supports file transfer between iPhone, Mac, and iTunes. It can even transfer just about all video/audio formats and DVD movies to iPhone directly without the help of any other software. And now, AVCWare iPhone Magic Platinum for Mac can also make iPhone ringtones from various video/audio files, download and convert desired videos from hot online video websites for iPhone. 1.Backup music, videos, photos, eBooks (PDF and EPUB formats), iPhone ringtones from iPhone to Mac. 2.Copy iPhone songs, movies and photos, etc. from iPhone to iTunes library quickly. Synchronize iPhone with iTunes. 3.Easily transfer local movies, music and photos on Mac to iPhone just like iTunes but more convenient than iTunes. 4.Rip DVD movies, DVD folder and ISO files to iPhone videos and audios with perfect quality, and then transfer converted files to iPhone directly. 5.Convert all popular video and audio formats like 3GP, AVI, FLV, MTS,MKV, DVR-MS, MPEG, TS, MPV, NSV, MOV, H264, RM, WMV, etc, and transfer them to iPhone in one step. 6.Easily download and convert online videos from top online video websites, like YouTube, Metacafe, Dailymotion, Break, Vimeo, Revver, Blip, Vidilife and Stickam, then transfer to iPhone. 7.Make special and customized iPhone ringtones from your favorite audios and videos.